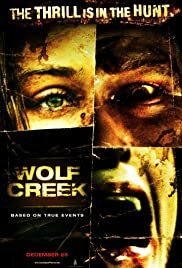 Three backpackers travel into the Australian Outback only to find themselves stranded at Wolf Creek crater. Once there, they are encountered by a bushman, Mick Taylor, who offers them a ride back to his place. Little do the three know that their adventure into the Outback would be a complete nightmare after the backpackers find a way to escape. Mick Taylor: I'm going to do something now they used to do in Vietnam. It's called making a head on a stick. Q: How did Mick know which car Liz would get into? Q: What is the significance of all the photos on the wall in Mick's place? Q: Is this film really based on a true story? 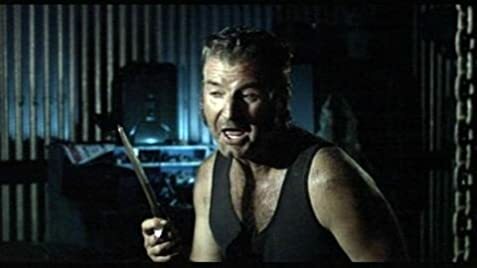 Wolf Creek has a completely standard basic story for this kind of genre movie - travelers in isolated location encounter sadistic nut. Despite this, it's what writer/director Greg McLean does with the details which makes a difference. The outback locations are rendered with a nice eye and evoke a sense of spooky isolation - anything could happen to you out here and no-one would know, much less be able to help. There is also the much discussed 'dark side of Crocodile Dundee' element - frankly, I can't believe it's taken so long for someone to conjure this one up, and McLean clearly delights in stabbing a knife through the heart of the mythical Aussie archetype. I think he's actually gotten to an uncomfortable, close-to-the-bone truth about the psyche of certain Aussie males, and John Jarret is eerily similar to the kind of individual one would encounter in many a country pub down under. The fact that this is an Australian film also makes it a rare bird indeed. For some unfathomable reason, the Oz industry rarely does genre, and when it does, usually doesn't do it well. With this in mind, Wolf Creek is something of a breath of fresh air. Yes, it hews pretty closely to the codes and rules of its genre, but for the most part it does it well, and for my money, what works about the film is strong enough to make some of the weaker plot moments forgivable. Will Gibson's HD camera-work is impressive, maintaining a consistent style from start to finish, aided by solid editing, score and sound design. Now maybe people will stop whining about how 'we can't make genre films here' and we might see some imagination and variety creep into Australian cinema. 79 of 146 people found this review helpful. Was this review helpful to you?